This is a fabulous stamp set by Avery Elle--Pick-n-mix...Halloween, Easter, Valentines it will cover many holidays. Colored with the clean color pens. Just a touch of color to this cute SU stamp. I like them both, but maybe my order-loving self might just like the framed one better. What do you think? 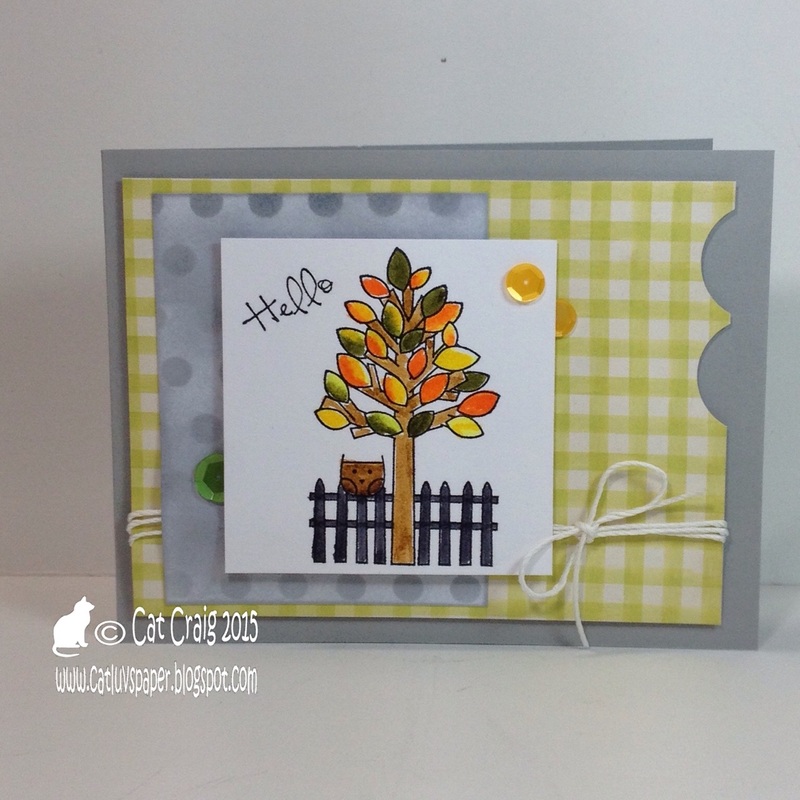 I love this little stamp, it works well for fall cards. This time its for Halloween. I don't like scary Halloween...it literally creeps me out! So I love sweet fall images. Coloring done with Copics. This was by far the fastest card to make. In stead of cutting the ghost out of white...I used the negative cut from black and placed it on white card. Another fast made card, a tiny bit of coloring with Copics on the SU image and some die cutting because the image is so small relative to the card size. I also love the web embossed card front to add a bit of texture to a card with small images. I am making a lot of Halloween cards this year; there are multiples of several designs. I need quick cards for the majority of my cards. Here is an example of a fairly quick one. The sentiment is from SU, stamped and die cut. A glittery spider at the tag edge and a web embossed onto the card front finish this card. I absolutely detest spiders. I even have a specially high pitched screech that explosively leaves my mouth whenever I see one. This causes two reactions...one my heart races as I figure out where the high ground is, and two- hubs comes racing from upstairs with a shoe handy...in kill mode. Apparently my spider scream is quite distinctive. No screaming needed with these paper versions though (thanks Betty for sending them). I have been off traveling again, this time for Hubs - a conference and it had taken me quite a few days to get back in the groove. I am getting this entry in for Leslie's challenge - The Crooked Stampers Sketch Challenge # 9 just before the door - er - the linky thingy locks me out! I love a sketch challenge. I am getting in under the wire barely over at Case this Sketch 145. Our nephew has a new job. 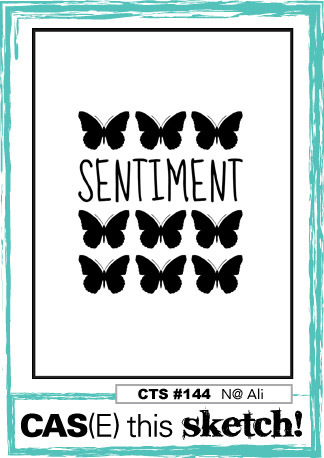 Sentiment by Paper Smooches, die cuts by Spellbinders. It's a a lot of orange... and it makes me smile! 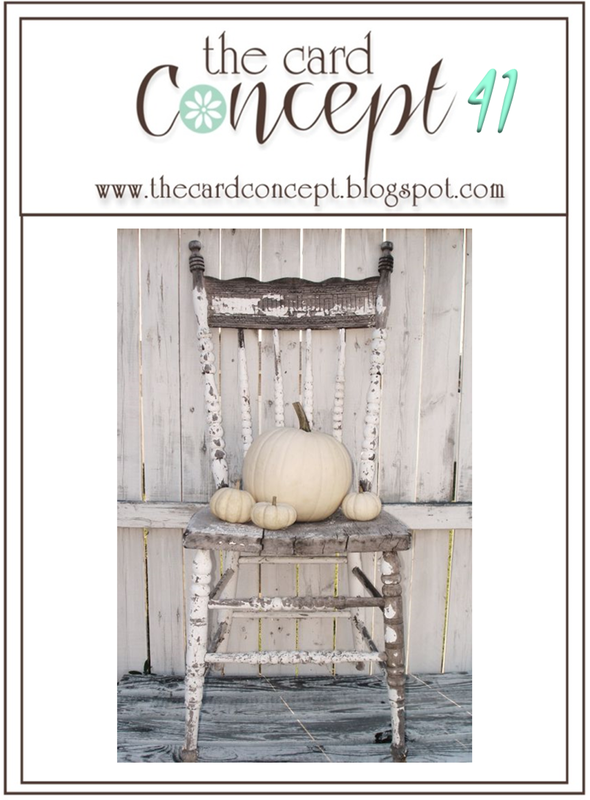 The wood grains and the white pumpkins really caught my eye and the greys too. I started with Simon Says Stamp (SSS) wood grain paper, some SSS stitched pumpkins colored with cool grey copics, and SSS clustered leaves die. Once my pumpkins were colored, I decided to fully coat them with white wink of stella and then some clear irrisitable pico embellisher just to make that sparkle come through a bit more. I am going for a classy and elegant style despite the rustic elements. 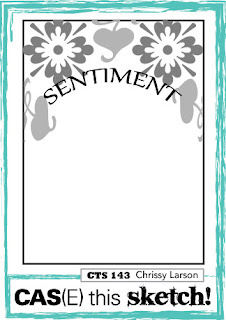 My sentiment is another SSS product from the Sending and Wishing stamp set stamped and silver embossed on vellum. Lastly a few of SSS moonshine sequins for a final touch. An entry to Simon's Monday Challenge - Autumn is in the Air. This was fun- masking (Its one layer), copic coloring, stencil inking, sky inking, heat embossing, and acrylic paint spattering. over at Cas(e) this sketch #144. I still have a few Halloween cards to make, and this sketch was a perfect inspiration. I thought making the Ghost stand out from the tombstones gave the sentiment a bit more punch. 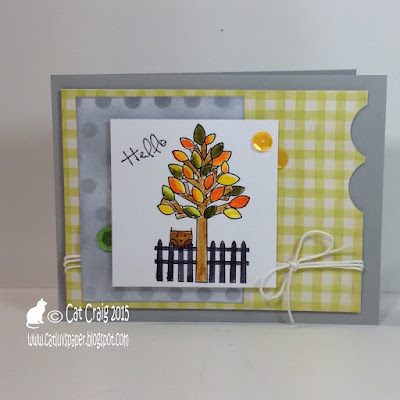 First a bit of fall watercolors, then I piled on the Simon Says Stamp pumpkin die cuts. I colored them using copic markers. Same with the little leaves. The front most pumpkin has a wink of stella coating and some pico embellisher on top to make it stand out just a bit more than simple foam mounting would achieve. The sentiment is from Sunny Studio. I hope you like my pumpkin patch! Thanks for stopping by. It is good to be back to card making. My second post today is for Muse Christmas Visions #22. It is a great design and I went with it. I was inspired by Marilyn's design and that her image repeating stripes in the scarf were somewhat repeated in the patterned paper. My favorite Snowman stamp is from Hero Arts. I combined him with some SU papers and sentiment; and a couple of dies from WPlus9 and MFT. My snowman was colored with markers and then stamped. I am trying to get into Halloween mode, after all it is October and I have about 2 weeks to get my cards made and mailed out. 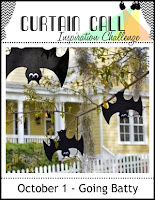 A challenge over at Curtian Call is a great starting point. Checking my stash of Halloween themed stamps...with a bat is one Lawn Fawn set. The bat is cute and I do like the punny sentiments. I stamped and colored 3 bats, then fussy cut them. The card base was dry embossed with SU's Woodland folder. A memory box fence die was added to my oval frame to confine the area for my bats. Small images are sometimes tough for me to place. I added a trail of A Muse sequins (I love that the packets are 3 shades in the color family). The sentiment was heat embossed prior to the dry embossing. The oval frame is from MFT. 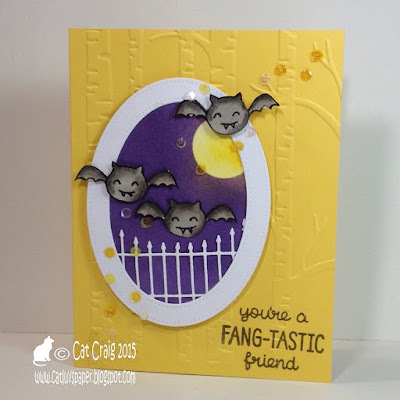 My inspiration was the three bats, the fence and the yellow house. It's been a while since I've played along over at Shopping our Stash, so I was happy to see this week's prompt was Wooden it be Nice. Participants are challenged to use something wooden. Options include wood veneer pieces, wood paper, wood-looking patterned paper, wood accessories. 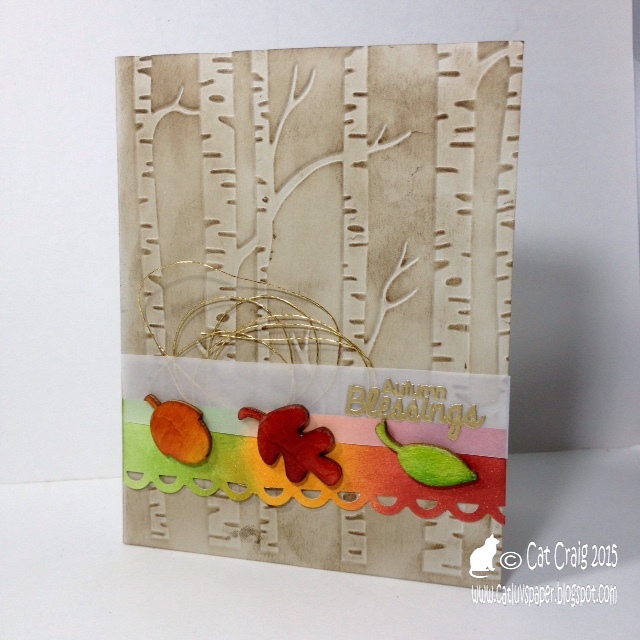 I used a Woodland embossing folder and wood veneer pieces that were colored in fall colors. My card base was embossed with the SU Woodland embossing folder, but upside down! errgh! So I turned it inside out and now had a debossed card base. Since these are supposed to be birch trees, I lightly inked the raised portions with some distress ink. I really like the result. The veneer pieces are also from Stampin Up. The sentiment is from a new to me Stamp company Sunny Studio, the set is Harvest Happiness and you'll be seeing the images during November. Such cute line images, I'll have fun coloring. I am still trying to get back into the swing of card making. I have bookmarked a few challenges. 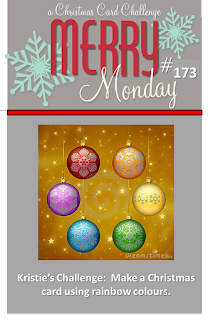 This is for Merry Monday #173, rainbow colors. This is my second post of the day, though they are more than 12 hours apart. I wasn't sure if I could just a few of the colors or all, but since it says rainbow, I figured it was all. It stumped me for two days, I have tossed out 3 card faces already...and then I delved into my bin of new stuff...and found this adorable little guy from Stampin Up set Christmas Cuties. I figured that scarf would give me the opportunity to use more colors. I had such fun coloring this cutie with Copic's, and the backgrounds are a mix of resist embossing and distress ink blending. The sentiment also comes in the above mentioned set. I am participating in a new to me challenge -- Share Joy Challenge. Darnell introduced this challenge to me through a recent blog post. The unique part of this challenge is that the participants are encouraged to not only make a card, but also to give it or mail it out! I decided to go with both more or less! For the coloring I used the Clean Color Real Brush tip markers on bristol paper. My stamp set is the first Taylored Expressions set I ever bought. It is called Love Grows Here.